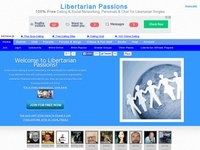 Libertarian Passions is a free social networking and online dating site for libertarian singles. Join for free and take advantage of free photo personals, blogs, email, chat, forums & more. While not specifically a Libertarian site, The Atlasphere is a site for admirers of Ayn Rand�s novels, from around the globe, to network both personally and professionally.